Aortic arch anomalies include multiple entities, more common ones being anomalous branching patterns such as common brachiocephalic arteries, aberrant right subclavian artery, right aortic arch, and vascular rings. Overall arch anomalies constitute around 15%–20% of congenital heart diseases. Isolation of arch vessels from the arch is distinctly uncommon. Isolation of the left subclavian with the right aortic arch is the most common arch anomaly of the above-mentioned type and is frequently associated with other intracardiac anomalies. We report an extremely rare case of isolated left brachiocephalic artery with the right aortic arch without associated intracardiac defects. A 9-year-old male child presented to us with a history of dyspnea on exertion (New York Heart Association-II), palpitations on exertion, and failure to gain weight. The symptoms onset dated back to early childhood. Furthermore, there was a history of recurrent lower respiratory tract infections during infancy and early childhood. There was no history of cyanosis, spells, or squatting episodes. The patient was born of nonconsanguineous marriage, and his birth and developmental history were normal, except for poor weight gain. He had three elder siblings and all of them were healthy. Before coming to us, he was evaluated at a local hospital and was diagnosed with a large patent ductus arteriosus (PDA) with pulmonary artery hypertension and was referred for further management. His height was 135 cm with a weight of 24 kg giving, a body mass index of 13.2 kg/m 2. 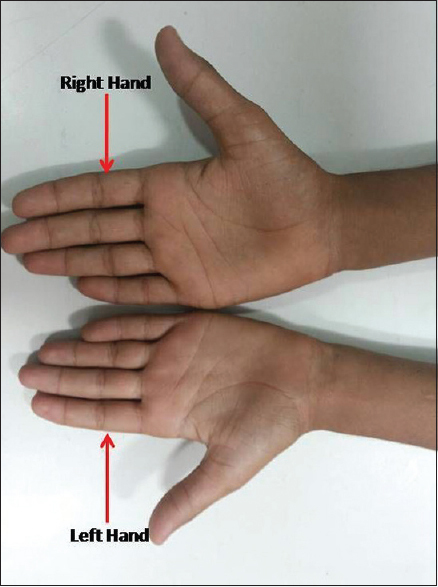 The notable finding on general physical examination was grossly atrophic left upper limb [Figure 1] as compared to the right upper limb. Left upper limb pulses were not palpable and pulse oximetry revealed room air saturation of 92% with dampened waveforms. Saturation and pulses in other three limbs were normal. There was no cyanosis or clubbing. Cardiovascular examination revealed cardiomegaly with hyperdynamic left ventricular (LV) type of apex. Auscultation revealed normal first heart sound, normally split S2 with loud P2 and LV S3. In addition, he had a Grade 3 continuous murmur, best heard at the left 2nd and 3rd intercostal spaces and a soft mid-diastolic murmur at apex. His chest X-ray showed cardiomegaly with cardiothoracic ratio of 0.65 with LV type of apex and increased pulmonary blood flow. Electrocardiography showed normal sinus rhythm with LV hypertrophy and normal axis. Subsequently, echocardiography was done which showed enlarged left atrium and LV. There were no intracardiac shunt lesions. A large PDA was present with continuous low-velocity left-to-right shunt and an unusual anterior orientation. The patient was taken up for cardiac catheterization. The aortic angiogram revealed a right aortic arch with only two arch branches, namely the right common carotid and the right subclavian. Surprisingly, no PDA was seen on aortic angiogram [Video 1]. However, during the delayed phase of aortic angiogram, the left carotid and subclavian and subsequently the pulmonary arteries were seen filling via collaterals from the right subclavian and carotid arteries. The findings were confirmed by selective injections in the right subclavian and carotid arteries [Figure 2]. Oximetry revealed a left-to-right shunt of 2.3:1 with mild pulmonary artery hypertension. The findings were suggestive of a diagnosis of the right aortic arch with isolation of the left brachiocephalic artery. A computed tomography (CT) angiogram [Figure 3] and [Figure 4] was subsequently done which established the diagnosis. It showed the right aortic arch giving rise to the right common carotid and right subclavian. 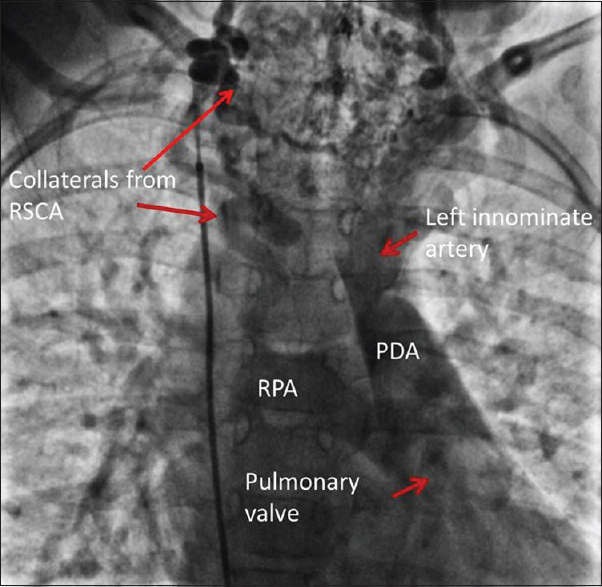 The left brachiocephalic was connected to pulmonary arteries via a large PDA with multiple collaterals from right subclavian and carotid. After confirmation of diagnosis, the clinical findings were reviewed and revealed nonpalpable left carotid with loud bruits in the neck and cranium along with absent pulses in the left upper limb. 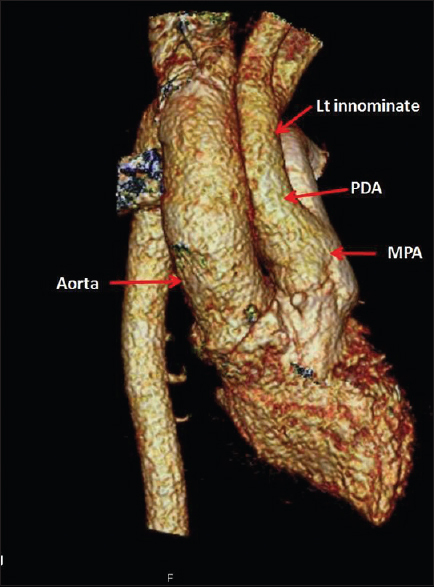 In view of significant symptoms and a large left-to-right shunt, the patient underwent surgical correction with re-implantation of left brachiocephalic to aortic arch and PDA ligation. The procedure was successful and the patient was doing well at last follow-up. Isolation of the left brachiocephalic artery with the right aortic arch is extremely uncommon anomaly with literature limited to few case reports., Even in these cases, the anomaly was not isolated, albeit associated with intracardiac defects such as ventricular septal defect and pulmonary stenosis. Association of this arch anomaly with DiGeorge syndrome  and Down syndrome is also reported. The embryological basis of this anomaly has been explained by the Edwards double arch hypothesis. As per this hypothesis, both right- and left-sided arches with their corresponding third, fourth, and sixth embryonic arches are present during initial stages of development. Regression of the left horn of aortic sac, left fourth arch, and connection between distal left dorsal aorta and left sixth arch with persistence of the left third and sixth arches and seventh intersegmental artery give rise to isolated left brachiocephalic artery. Abnormal partition of primitive truncoaortic sac giving rise to pulmonary-brachiocephalic connection is alternative proposed mechanism giving rise to this anomaly. The left arch variant with isolation of right subclavian is even rarer  and arises from regression of the right fourth arch and right dorsal aorta with persistence of right sixth arch. The clinical presentation is dominated by the associated anomalies and syndromes. Isolated cases, as in our report, can be asymptomatic or present as left-to-right shunts with features of pulmonary overcirculation or with severe pulmonary arterial hypertension. Symptoms of vertebrobasilar insufficiency due to subclavian steal have also been reported , but were absent in our patient. Surgical correction with re-implantation of left brachiocephalic to the arch seems the preferred treatment option in symptomatic patients., Asymptomatic patients without associated intracardiac anomalies and significant left-to-right shunt can be managed conservatively with periodic follow-up. 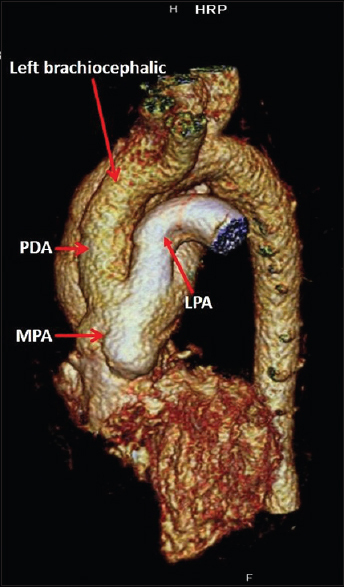 Transcatheter closure of PDA in a case of the right aortic arch with isolated left subclavian has also been reported. Although it can eliminate the left-to-right shunt, it will not correct the anomaly completely as the flow in left brachiocephalic remains retrograde only. As our patient was young with significant growth potential, we preferred the surgical correction which restores normal blood flow with elimination of left-to-right shunt. This rare anomaly which can have varied presentation can be suspected from clinical clues such as absence of left carotid and upper limb pulses in the presence of PDA and bruits in the neck and cranium. On echocardiography, a right aortic arch with PDA in otherwise normal heart should also arouse suspicion. CT angiography and cardiac catheterization provide definitive diagnosis. Awareness regarding the entity and a comprehensive clinical examination is a must to clinch the diagnosis. Goldmuntz E. The epidemiology and genetics of congenital heart disease. Clin Perinatol 2001;28:1-10. Moes CA, Freedom RM. Rare types of aortic arch anomalies. Pediatr Cardiol 1993;14:93-101. Luetmer PH, Miller GM. Right aortic arch with isolation of the left subclavian artery: Case report and review of the literature. Mayo Clin Proc 1990;65:407-13. Kreeger J, Schlosser B, Sallee D, Border W, Deshpande S. Isolated innominate artery from the main pulmonary artery in DiGeorge syndrome. J Am Coll Cardiol 2011;57:753. Mangukia C, Sethi S, Agarwal S, Mishra S, Satsangi DK. Right aortic arch with isolation of the left innominate artery in a case of double chamber right ventricle and ventricular septal defect. Ann Pediatr Cardiol 2014;7:148-51. Kaku S, Pinto F, Lima M. Isolation of the left brachiocephalic artery associated with right aortic arch and left-sided arterial duct. Cardiol Young 1996;6:239-41. Edwards JE. Anomalies of the derivatives of the aortic arch system. Med Clin North Am 1948;32:925-49. Männer J, Seidl W, Steding G. The formal pathogenesis of isolated common carotid or innominate arteries: The concept of malseptation of the aortic sac. Anat Embryol (Berl) 1997;196:435-45. Türkvatan A, Paç A, Kiziltepe U, Olçer T, Cumhur T. MDCT angiography of isolated right subclavian artery. Turk J Pediatr 2010;52:668-72. Le Bret E, Leobon B, Roubertie F, Sigal-Cinqualbre A, Stos B, Houyel L, et al. Right aortic arch and isolated left innominate artery from a left sided patent ductus arteriosus: A very rare aortic arch anomaly. J Pediatr Surg 2009;44:E29-31. Joseph A, Core J, Becerra JL, Kaushal RD. Right-sided aorta with complete isolation of the left innominate artery. Radiol Case Rep 2015;11:21-4. Singh B, Satyapal KS, Moodley J, Rajaruthnam P. Right aortic arch with isolated left brachiocephalic artery. Clin Anat 2001;14:47-51. Gowda SL, Bhat PS, Jayaranganath M, Hegde M. Isolated left brachiocephalic trunk arising from the main pulmonary artery with right aortic arch. J Thorac Cardiovasc Surg 2014;147:822-3. Jones TK, Garabedian H, Grifka RG. Right aortic arch with isolation of the left subclavian artery, moderate patent ductus arteriosus, and subclavian steal syndrome: A rare aortic arch anomaly treated with the Gianturco-Grifka vascular occlusion device. Catheter Cardiovasc Interv 1999;47:320-2.